“I saw angels in my toast bread. I really did see two angels in my toast bread. This has to be a sign from God”. Granny Helen was so convinced that she saw the two angels in her toast bread that she called all of her friends from the bingo club, the village’s priest and the mayor. “I swear there are two angels in my bread”. There were indeed two angel figures in Grandma’s Helen toasted bread, there was no doubt about that. “The figures on the toasted bread resemble extraterrestrial activity which is probably a way aliens prefer to communicate”, said the mayor who is a well known fan of alien TV shows among the people going the bar-restaurant Three Running Turtles. At the same time, Charlie, her 18-year-old grandson was chuckling with his friend Joey. That selfie toaster was the best birthday present they could have ever bought for Charlie’s grandma. Totally worth the money. It is one of the things that it would never cross your mind. Having your toasted bread in the morning burned with a picture of your face and spread with peanut butter on the other side is something that you don’t do every day. Deeeeelicious. 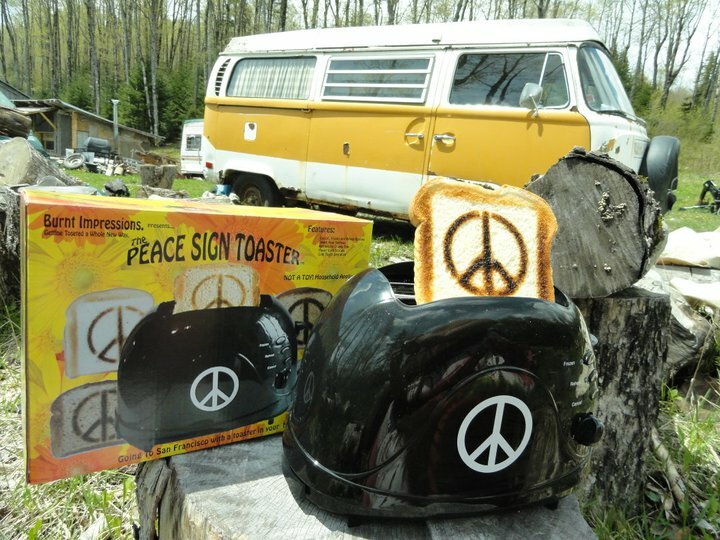 Vermont Novelty Toaster Corporation, a company located in the USA, makes your morning toasted bread way more different and weirdly enough, entertaining than you are used to up till now. It might be the first time in your life that you would be searching for old bread in your house in order to make a toast of your face. All you have to do is send the company the picture of your preference and they will produce a toaster for you which toasts bread with your face, your company’s logo, the wife’s neighbour (be careful with that) or anything else that you might be thinking of. If you got already bored with your duckfaced selfies with your polaroid, maybe you should give it a try and “get your face toasted”. A great invention which every household ought to get. The “toasted selfie” is directly available at Vermont Novelty Toaster Corporation website where you can order it for only $75 with free shipping in USA. Because narcissism is the new black. Do you like taking photos? Maybe you should read about the ultimate camera for parorama pictures. Are you curious about the calories you are drinking? Vessyl the smart mug is the right article for you. All you cook is noodles I guess. Check out how you make things even easier for you.